The understanding of bicarbonate kinetics and CO2 retention in the body is necessary to conduct amino acid tracer oxidation studies in both humans and laboratory animals. Significant metabolic activity is associated with eating which can affect bicarbonate steady state kinetics. A study was conducted to assess the impact of feeding regimen on the recovery of labelled bicarbonate and energy expenditure in adult female pigs (sows). Five catheterized sows (235 ± 5 kg) were fed semi-synthetic diets as: a single meal 2 h into the infusion after an overnight fast, or in eight hourly meals starting 2 h before the infusion. Oxygen consumption, CO2 production and 14CO2 recovery (ie fraction not retained) were determined during primed, constant intravenous infusions of NaH14CO3. The 14CO2 recovery (%) after fasting (58.1 ± 4.8) was lower than that after single meal feeding (78.8 ± 5.9) or hourly meal feeding (81.0 ± 2.6, P = 0.03). CO2 production correlated with 14CO2 recovery during hourly feeding (r = 0.40, P = 0.01); this relationship was not significant after single meal feeding (P = 0.30), probably due to physical activity-associated CO2 production. The correlation of CO2 retention factors with CO2 production during hourly feeding suggests that this regimen should be preferred for future amino acid kinetics studies. Traditionally, measures of energy and protein metabolism have rarely been studied simultaneously in the same animal although there is a need to do so. We constructed an experimental protocol that allows the measurement of energy expenditure at the same time as the measurement of amino acid oxidation for studies in amino acid requirements, protein kinetics and energy metabolism in adult pigs. The study of amino acid requirements using an amino acid oxidation method necessitates the knowledge of the degree of retention of labelled CO2 generated during the oxidation of the labelled amino acid. Although bicarbonate kinetics and CO2 retention are well documented for humans , parenterally-fed piglets  and chickens , no data were found for adult sows, which we intend to use to answer questions in both human and pig nutrition. Although the retention of CO2 is dependent on the physiological state (i.e. post-absorptive or postprandial) and on the type and extent of exercise in humans , comparable observations in pigs are lacking. The retention of CO2 may be linked to the total production of CO2 by the animal, which has been shown to fluctuate with physical activity and digestion . Because an influence of feeding and activity on the retention of CO2 and on energy metabolism is expected, it is necessary to identify an appropriate experimental protocol to avoid biased measurements of amino acid oxidation and energy expenditure and to maintain the comparability of measurements made between animals. The objectives of this experiment were: 1) to determine the CO2 retention in adult sows during the post-absorptive state and the postprandial state when fed either a single meal or hourly meals, 2) to assess the effect of these feeding regimens on CO2 and heat production, and 3) to describe the relationship between CO2 retention and CO2 production. For the calibration of the respiration systems, the mean recoveries of 14CO2 and CO2 were 101.8% (SD 3.1, n = 16) and 105.2% (SD 2.3, n = 16), respectively, and did not differ (P > 0.57) between the two experimental chambers and air systems. In the animal experiments, sows were offered half their daily allowance in two modes: a single meal 2 h into the infusion experiment after 12 h of food deprivation (F1), or, 2 to 4 days later, in eight hourly meals starting 2 h before the infusion experiment (F8). One animal refused to eat during the infusions in F1 and F8; these data were discarded, and so all results are for 5 sows. During F1, the fasting 14CO2 recovery of 58.1% (SD 4.8) was lower than the mean recovery of 78.8% (SD 5.9) after feeding (P = 0.03). In F8, the 14CO2 recovery was similar in the CO2 collection periods when the pigs were offered feed (85.7%, SD 4.4) versus those periods without feeding (78.5%, SD 2.8) (P = 0.20); the overall 14CO2 recovery during F8 was 82.1% (SD 2.6) which was not different than the recovery after feeding in F1 (P = 0.57). Throughout the entire study period, CO2 production significantly correlated with 14CO2 recovery in F1 (r = 0.35, P = 0.02) and in F8 (r = 0.41, P = 0.01). However, this relationship between 14CO2 recovery and CO2 production was not significant in the sub-set of data for F1 immediately after feeding (P = 0.30). Figure 1 shows that the CO2 production in F1 increased sharply immediately after feeding with a subsequent decline to almost fasting values, while the 14CO2 recovery remained at a constant high level for 6 h after feeding. In F8, the 14CO2 recovery showed little variation throughout the 4 h study (Figure 2). Carbon dioxide production, energy expenditure and 14CO2 recovery in sows given a single meal of half of daily intake. After a 12 h food-deprivation, intravenous NaH14CO3 solutions were infused for 2 h prior to feeding and for 6 h after feeding. CO2 production and energy expenditure were calculated each minute and breath 14CO2 was collected in 30 min periods. Data are means of n = 5 sows at each time point. : Energy expenditure. : CO2 production. ●: 14CO2 recovery. Carbon dioxide production, energy expenditure and 14CO2 recovery in sows given hourly meals, each of one-eighth of daily intake. After 2 hourly feedings, intravenous NaH14CO3 solutions were infused for 4 h with hourly feedings maintained. CO2 production and energy expenditure were calculated each minute and breath 14CO2 was collected in 30 min periods. Data are means of n = 5 sows at each time point. : Energy expenditure. : CO2 production. ●: 14CO2 recovery. With respect to minute by minute gas measurements, the CO2 production of sows fed a single meal (F1, Figure 1) was comparatively low after an overnight fast. Within 10 min after feeding, the CO2 production almost doubled. This level of CO2 production was maintained for approximately 27 min, followed by a decrease over a period of about 90 min. Thereafter, the CO2 production remained fairly constant for 272 min until the end of the experiment. In pigs fed hourly meals (F8, Figure 2), the CO2 production increased after feeding and remained at a high level for a short period of time (12.5 min, SD 1.7), then declined within approximately 15 min to its initial value and remained there for 29.5 min (SD 3.5) until the next feeding. This pattern was repeated at each feeding. In both F1 and F8, the O2 consumption and energy expenditure followed the same pattern as the CO2 production. In F1, fasting O2 consumption, CO2 production and energy expenditure were lower (P < 0.01) than immediately after feeding or postprandially (Table 1). The respiratory quotient (RQ) in F1 was greater (P = 0.001) postprandially than during fasting, but not different from the peak data. In F8, RQ, O2 consumption, CO2 production and energy expenditure were greater (P < 0.001) during the peak phase compared to postprandially. CO2 production and energy expenditure and O2 consumption during the peak phase were similar (P > 0.2) for F1 and F8, whereas for the postprandial phase, these parameters were lower in F1. The RQ was greater (P < 0.001) for F1 than for F8 during the peak phase, but similar postprandially. The effect of digestive activity on energy expenditure was 4.54 kJ/min for F1 and 5.66 kJ/min for F8, with a mean of 5.10 kJ/min. The energy expenditure due to physical activity was 11.27 kJ/min for F1 and 9.95 kJ/min for F8, with a mean of 10.61 kJ/min. In this experiment, we studied the effect of feeding regimen on the CO2 production and 14CO2 recovery to support future studies of amino acid kinetics and energy metabolism in pigs and enable comparability with other species. The feeding regimens chosen were: a single meal after an overnight fast to represent the common practice in commercial pig production, and hourly meals as an attempt to approximate a physiological steady state with regard to intended subsequent isotope infusion experiments. 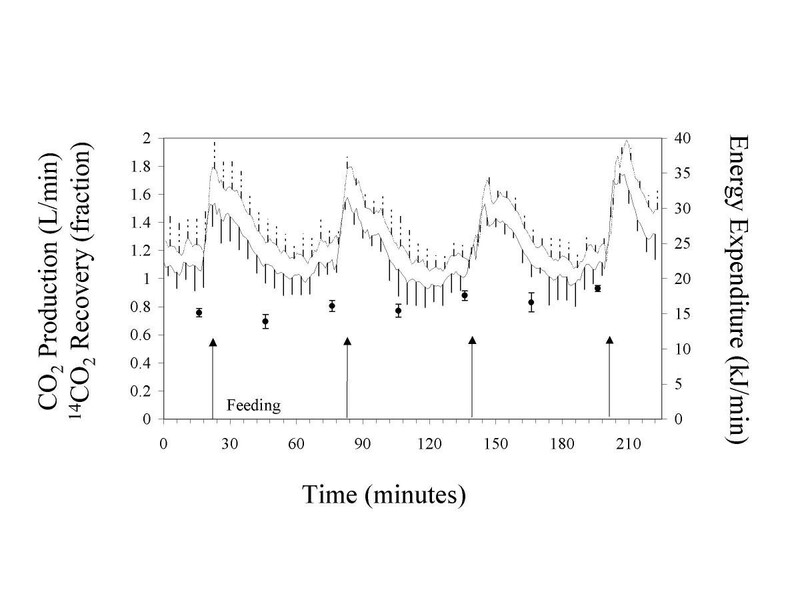 Because the absorption of nutrients from casein-based, semi-synthetic diets peaks two hours after a meal , the hourly feeding was initiated two hours prior to the start of the CO2 production and recovery measurements in order to achieve a steady state. 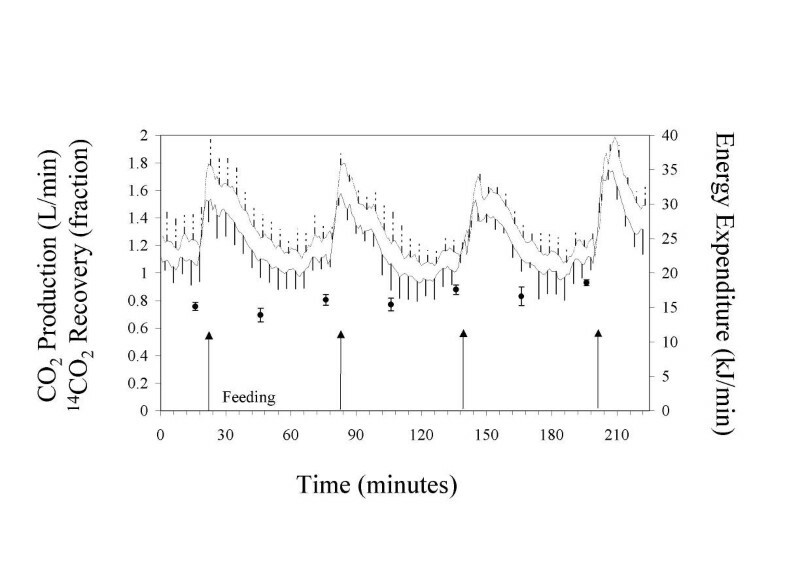 Because we did not measure these parameters in the preprandial state of the hourly feeding experiment, the comparison of fasting versus feeding is based on the study involving a single meal, whereas the effect of the feeding regimen is derived from the comparison of the postprandial state after a single meal versus the entire study period with hourly meals. These comparisons are relevant because the same pigs and the same diets were used for both feeding regimens. The comparisons of feeding regimens are apparent in the time-course of CO2 production and energy expenditure (Figs. 1 and 2), which was similar to the time-course of CO2 production observed by Ball and Bayley  in piglets and by el-Khoury et al. [10, 11] in humans. In the fasting state, the CO2 production and energy expenditure was lower than after feeding, consistent with the observations by el-Khoury et al. . The fasting energy expenditure of 18 kJ/min, or 432 kJ/kg0.75, was close to the maintenance energy expenditure of 458 kJ/kg0.75 . Feeding, being a period of intense activity in pigs, caused a sharp increase in the CO2 production and energy expenditure. The increase in energy expenditure was 10.6 kJ/min or 59% of the fasting energy expenditure and within the range reported by Ramonet et al. , who showed that bursts of activity can increase energy expenditure to twice the fasting level. In humans, non-exercise activity thermogenesis has been shown to increase energy expenditure by approximately 40% above the resting metabolic rate . Subsequently, the CO2 production and energy expenditure decreased to a plateau level approximately 29% greater than the fasting CO2 production and energy expenditure. Because we could not separate the thermal effect of feed from that of activity completely, our estimate was somewhat larger than the estimate of 20% by Ramonet et al. . While the activity-induced energy expenditure was similar for F1 and F8, the postprandial energy expenditure was greater in F8 than F1. This difference may be caused by the presence of the 'short time thermal effect of feeding'  which would indicate continuous energy expenditure due to digestion in F8, but not in F1. Despite this, the average energy expenditure was similar for F1 and F8, probably because the periods of activity were shorter and the decrease in energy expenditure after activity was quicker in F8 than in F1. These data indicate that, similar to humans , the comparability of CO2 production or energy expenditure was maintained between both feeding regimens, although the time-courses were quite different. However, it appears that the level of CO2 production and energy expenditure was overestimated in our short time measurement compared to complete 24 h measurements. It can be expected that methane production would amount to about 1% of the digestible energy intake . The energy expenditure was calculated using caloric factors for CO2 and O2 (Brouwer formula) . According to this formula, the quantitative excretion via urine of ingested nitrogen would account for a further 0.5% of the digestible energy intake. Therefore, it is unlikely that the omission of methane and urinary energy caused the discrepancy. Rather, the overestimation was probably due to the omission of the respiration measurement during the night when resting animals produce significantly less heat and CO2. Therefore, the estimates given (kJ/min) should not be extrapolated to 24 h values, unless future experiments show a reliable relationship between short time and 24 h measurements. The 14CO2 recovery correlated well with CO2 production during both feeding regimens. After an overnight fast, 14CO2 recovery (58%) was lower than after feeding either a single meal (79%) or repeated hourly meals (82%). The lower recovery of 14CO2 during fasting is consistent with the observations of el-Khoury et al. and Leijssen and Elia  in humans. These authors  also argued that hourly meals allowed the application of a single recovery factor for isotope infusion studies, based on the lower variability of the 14CO2 recovery during frequent feeding. In the present experiment, the variability of the 14CO2 recovery data was similar for F1 after feeding and for F8. The mean 14CO2 recovery in the postprandial state in our experiment was 81%, which is lower than the 93% reported for parenterally fed piglets  and slightly greater than the average recovery of 77% reported for adult humans . In contrast to el-Khoury et al. , there appeared to be no strong relationship between 14CO2 recovery and CO2 production immediately after feeding a single meal to sows, probably due to the significantly greater physical activity in sows versus humans. When fed hourly, however, there was a significant correlation between 14CO2 recovery and CO2 production. In humans, exercise led to an increase in CO2 recovery , although the increase – in accordance with the level of activity – was greater than observed in the sows. The correlation between 14CO2 recovery and CO2 production implies that the CO2 retention factors adequately reflect the CO2 production under conditions of hourly feeding. The CO2 production or 14CO2 recovery was greater after meals than after an overnight fast, but did not differ postprandially between a single meal or hourly meals. Therefore, different retention factors should be applied when studying amino acid oxidation pre- or postprandially. Both feeding regimens led to an overestimation of energy expenditure because the measurements were taken predominantly during the time after feeding and did not incorporate the resting energy expenditure to a sufficient degree. Despite the overestimation, the relative effects of nutritional intervention on energy metabolism can be elicited. To derive valid daily energy expenditure values from a short measurement period, its relationship to a full 24 h measurement period should be established. 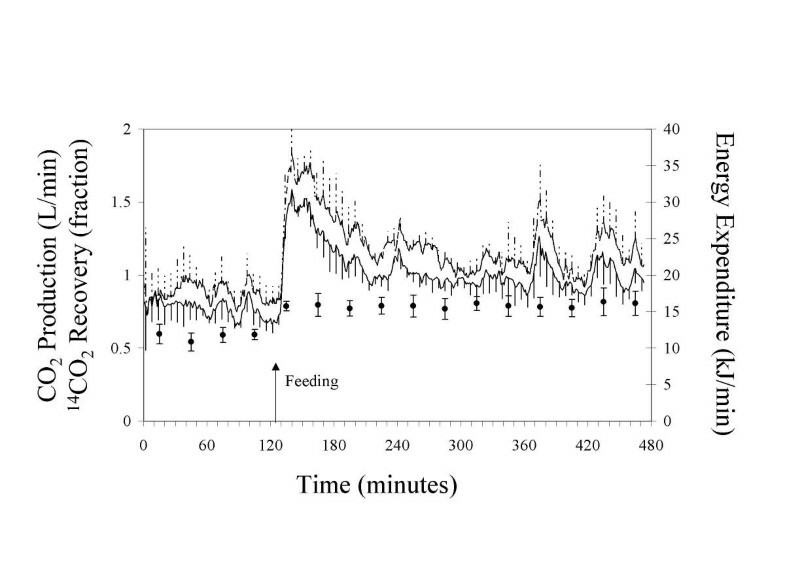 The significant correlation of CO2 production and 14CO2 recovery during hourly feeding, but not after a bolus feed, suggests steady state is not achieved in animals after a single feed. This dissociation is probably due to excessive physical activity following the single feeding. Offering hourly meals should therefore be the preferred feeding regimen for future amino acid oxidation studies in animals. Respiration boxes of about 2 m3 volume were built around commercial farrowing crates and fitted with a feeder and drinker. Air was drawn through these boxes via an inlet at the rear and an outlet above the trough at rates of approximately 240 L/min. After passing through a cold water condenser to remove water from the air, air flow was divided between a series of gas washing bottles for CO2 collection and a separate air line for gas analysis ('bypass'). The flow rate through each diversion was measured with two commercial air meters (Canadian Meter Corp., Cambridge, Canada). The CO2 collection stream consisted of five gas washing bottles (four in parallel and a final bottle) followed by a solvent trap. Part of the bypass stream of air was drawn with a small air pump (Gast Model 0531, Gast Mfg. Corp., Benton Harbour, MI) and delivered to oxygen (Taylor-Servomex, Crowborough, UK) and CO2 analysers (Beckman LB2, Beckman, Irvine, CA). Air flow to the analysers was regulated by ball-type flowmeters (Scienceware Size 2, Fisher Scientific, Mississauga, Canada). The analog output (mV) was converted to digital data by an analog-digital converter (Datagrabber, Data Electronics, Australia) and recorded by a computer. Data acquisition was set for maximum rate (four readings per second) and the average gas concentration for each minute was recorded. The equipment was pressure-tested to ensure that the system contained no air leaks. The recovery of CO2 and 14CO2 by the system was determined by releasing a known quantity of CO2 and 14CO2 in the respiration chambers. Four moles of NaHCO3, equivalent to the hourly CO2 production of a 250-kg sow being fed maintenance energy intake, were dissolved in 4 L of water and spiked with 37 kBq of NaH14CO3 (American Radiolabeled Chemicals, St. Louis, MO). The solution was placed on a magnetic stirrer inside the respiration chamber and air was collected immediately thereafter. The CO2 was released by the addition of 4.5 mol of concentrated HCl over 1 h using syringe pumps. After 2 h of air collection in 30 min collection intervals, the quantitative release of CO2 was confirmed by sampling the bicarbonate solution and measuring the remaining radioactivity. The CO2 concentration in the bypass flow was recorded at 1 min intervals throughout this 2 h period. On each study day, the O2 and CO2 analysers were calibrated for their zero and gain readings with either pure N2 (zero) or calibration gas (21% O2, 1.5% CO2, 77.5% N2). The average readings for the zero and calibration gases were each recorded for 5 min immediately before and after each study to correct for any change in analyser readings during the study. Each gas washing bottle was filled with 100 mL of CO2 absorber solution (monoethanolamine:2-methoxyethanol, 1:2; Caledon Laboratories, Edmonton, Canada). After each 30 min collection, the pooled volume in the first four bottles and separately, in the fifth bottle, were weighed and sampled. For the first four bottles, 0.5 g of the sample was weighed in a scintillation vial, diluted with 0.5 ml of 2-methoxyethanol, and mixed with 5 mL of a scintillation cocktail (Atomlight, Canberra Packard, Mississauga, Canada); for the fifth bottle, 1 g was weighed and mixed with 5 mL of scintillant. Absorber from the final solvent trap was also weighed, sampled and counted at the end of each study day to verify complete collection. All samples were collected in duplicate and counted in a scintillation counter (Beckman LS 3000, Beckman, Irvine, CA) for 15 min or to a 2 σ error of 2%. Six adult sows (235 kg, SD 5), non-pregnant after their fourth parity, were surgically implanted with catheters in the cephalic vein for isotope infusion. After surgery, they were left to recover for at least 7 d. Between studies, the animals were housed individually in pens 1.5 by 2.1 m fitted with rubber mats. The animal room was temperature controlled at 21°C. All procedures were approved by the Faculty Animal Policy and Welfare Committee of the faculty Agriculture, Food and Human Ecology, University of Alberta. The semi-synthetic diet contained (g/kg diet) casein (27.5), cornstarch (200.0), corn oil (20.0), sulkaflok (150.0), sugar (527.4), L-cystine (1.67), L-threonine (1.96), L-tryptophan (0.27), L-isoleucine (0.24), L-aspartate (2.02), L-glutamate (2.02), chromic oxide (5.0), limestone (11.0), di-calcium-phosphate (23.0), magnesium sulfate (1.0), potassium bicarbonate (6.2), sodium bicarbonate (3.5), sodium chloride (2.2), thiamin (0.005), vitamin B6 (0.005), vitamin and mineral premix (15.0); the premix contained (per kg) Cu (2000 mg), I (20 mg), Fe (15 g), Mn (1200 mg), Se (30 mg), Zn (12 g), vitamin A (1,000,000 IU), vitamin D (100,000 IU), vitamin E (8000 IU), vitamin K (200 mg), biotin (20 mg), choline 100,000 mg), folacin (160 mg), niacin (4000 mg), pantothenic acid (2500 mg), riboflavin (1200 mg), and vitamin B12 (3000 μg). This diet provided twice the maintenance requirement for amino acids and at least 120% of the mineral and vitamin recommendations of NRC  for gestating sows. The diets were offered to exceed the maintenance energy requirement  by 10%. Between study days, the animals were fed twice daily. On study days, sows were offered half their daily allowance in two modes: a single meal 2 h into the infusion experiment after 12 h of food deprivation (F1), or, 2 to 4 days later, in eight hourly meals starting 2 h before the infusion experiment (F8). The hourly feeding regimen was imposed on the day of study only. Each animal was subjected to both treatments in a randomized crossover manner. The recovery of 14CO2 was determined during primed, constant infusions of a saline solution containing NaH14CO3. The priming dose of 20% of the hourly infusion dose of NaH14CO3 was administered within 1 min. The constant dose was infused by syringe pump (Fisher Scientific, Mississauga, Canada) at an approximate rate of 95 kBq/h for either 8 h (F1) or 4 h (F8); the infusion solution was weighed and sampled immediately after each infusion to measure actual radioactivity delivered. Throughout the study, 14CO2 was collected in 30-min intervals. Because repeated measurements were conducted in each animal, the background radioactivity in breath was determined during a 30 min CO2 collection before each isotope infusion. This background collection was started as soon as the CO2 content in the air drawn from the box had reached an equilibrium as measured by the CO2 analysers. Oxygen consumption and CO2 production were monitored in 1 min average measurements throughout the infusion studies. The air flow in the respiration system was corrected to 0°C and an atmospheric pressure of 760 mm Hg. Oxygen consumption and CO2 production were calculated by multiplying the corrected air flow by the 1 min average gas concentration after correcting for room air. The respiratory quotient (RQ) was calculated by dividing the CO2 production by the O2 consumption. The energy expenditure was calculated using caloric factors for CO2 and O2 (Brouwer formula) . Methane production and urinary N excretion were omitted from the formula because they were not measured. The CO2 production was divided into three phases: 1) the fasting phase in F1 prior to feeding, 2) the period of high CO2 production immediately after each feeding in both F1 and F8, and 3) the postprandial phase following this period of high CO2 production in both F1 and F8. A non-significant regression of CO2 production on time was used to define plateaus during these phases. The resulting time periods were used to estimate the O2 consumption, RQ and heat production during the three phases. The effect of digestion was calculated by subtracting the fasting data from the postprandial data. The effect of physical activity was estimated by subtracting the data from the postprandial phase from the data directly after feeding. To compare the CO2 production to the 14CO2 recovery, 30-min values were calculated for the CO2 production to coincide with the collection of 14CO2. Data are presented as means and SD. One-minute means were calculated within feeding frequencies and phases assuming 'sow' to be a random effect. Data across three phases within F1 feeding were analyzed by ANOVA using Fisher's (protected LSD) multiple comparisons between groups and were considered significant when P < 0.05 . Differences between the two phases of F8 feeding as well as the effects of the feeding regimen on CO2 excretion, O2 consumption, 14CO2 recovery, and RQ were evaluated using Student's t-test. The relationship between CO2 production and 14CO2 recovery was assessed using Pearson's correlation coefficients. Supported by a grant from the Alberta Hog Industry Development Fund. The amino acids were generously donated by Degussa AG, Germany. SM and RFPB designed the experiment, carried out the animal studies, analyzed the data and drafted the manuscript. PBP and ROB supervised the overall project and edited the manuscript. All authors read and approved the final manuscript.